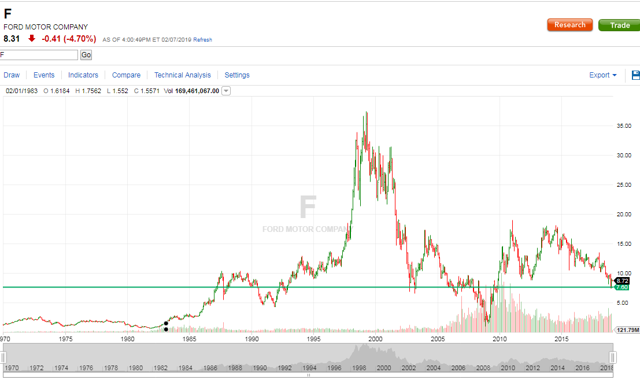 Ford stock is interesting (F). Ford stock dividend safety is always in question. I really dislike the stock. There are just too many other plays out there with solid dividends and growth prospects. 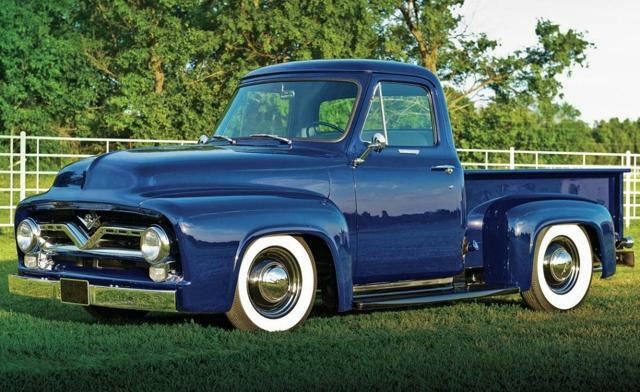 One highlight of success is Ford Credit. Credit is firing on all cylinders (pun intended) with Year-over-year decreases in loss-to-receivables and their best Earnings Before Taxes in eight years. 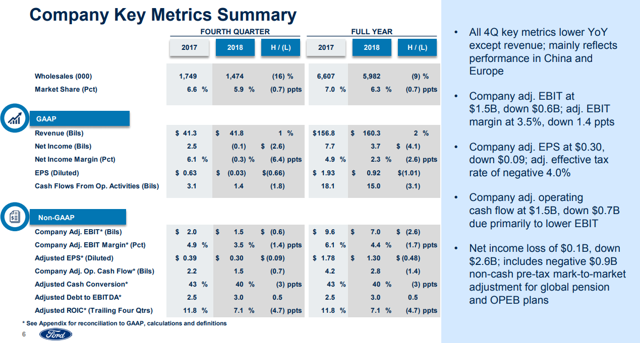 Ford enters 2019 with a very clear vision, and we’re building momentum to improve profitability and returns. We’re now in execution mode…we’re taking decisive action in all underperforming parts of the business…In the coming months, you can expect us to share much more about specific initiatives in some of these areas that we’re restructuring. While I view those as positive comments, what the CFO said directly before this bears more attention. …to go back to the balance sheet, and investment grade priorities that you communicated in Detroit, what is a higher priority, sustaining the current dividend or maintaining investment grade? The CFO had a lot to say as can be seen below. I encourage you to read the analyst call report in its entirety. A few highlighted sections are below. 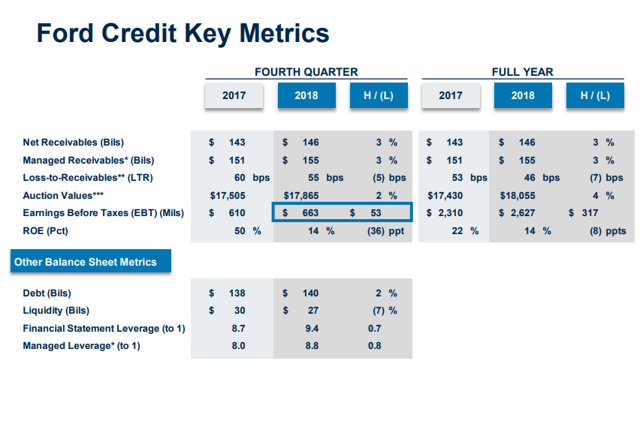 As you read the excerpt, remember in August of 2018, Moody’s took its credit rating on Ford to Baa3 from Baa2 with a negative outlook, pointing to its market position and its restructuring efforts for the reasons for the downgrade. At Baa3, Ford is one notch away from junk status. …our overall financial strategy. It starts with a strong balance sheet, an investment grade rating, maintaining our debt capacity, and ensuring that our global funded pension plan stays funded and de-risked. So to me that is sort of like ground zero…then the business has got to generate the cash flow that enables us to fund everything else. Everything else includes the traditional business, the new business opportunities, it includes obviously the shareholder distributions. So I think that that’s the foundation, and that’s certainly how we’re looking at the business and running the business. The dilemma that we’re facing is the rating agencies are concerned about the operating performance of the business and the trend that we’ve been on. We’ve had a lot of discussions with them about that and the plans that we have in place to address that. At least my interpretation, again, from chatting with them is it’s not a concern around the balance sheet per se. It’s really about the operating performance…. We expect to be able to fund all of our business needs including the regular dividend, but we have to prove that. Simply, a tariff is a tax on imports between sovereign states. It’s been almost a year since Trump made the surprise announcement that he wanted a 25% tariff on imported steel and a 10% tariff for aluminum. Trump wanted to increase U.S. production of these metals to combat what he sees as unfair trade practices. While some would argue that there is a time and place for tariffs, in general, they have unattended consequences of slowing down the economy, injuring international trade relations, and causing consumer prices to go up as competition decreases coupled with rising feed stocks. The AIADA also stated that with auto sales flattening, this was the worse time for steel and aluminum tariffs to be implemented. Fortunately for Ford, they buy the vast majority of its steel and aluminum for U.S. production in the U.S. Comparatively, 90% of General Motor’s (NYSE: GM) steel is sourced from the United States. However, we don’t have to go back too far in history to look at the last time steel tariffs were tired – an analysis of tariffs on steel imposed in 2002 found that the Bush steel tariffs cost 200,000 jobs, including 30,000 in Michigan, Ohio, and Pennsylvania alone. Tariffs are sometimes sold by saying the other country (or countries) are cheating or getting more than they should. The problems with tariffs is that these types of policies can get out of control with each country adding more and more trade restrictions on each other causing overall decline in trade, inefficiency, and overall wealth destruction. If a tariff for aluminum and steel, why not for other industries as well. Don’t all U.S. companies deserve protection? (I’m being facetious). The point is the U.S. steel industry will benefit from steel tariffs, but society will pay more for goods with steel in their industrial process. This is especially true if steel can be purchased outside of the U.S.A at a cheaper rate. Protectionist policies favor industries who compete with foreign manufacturers over those industries that do not compete with foreign manufacturers. In the 10 months since the Trump administration imposed 25% tariffs on steel imports, prices in the United States are now back to levels last seen before the tariffs were announced on March 1. Hiring in the steel sector remains poor which appears directly attributable to automation. Steel industry employment was 146,300 as of November — 4% percent lower than it was four years ago. Is Ford’s Dividend at Risk? Maybe the statement should be: Ford needs to cut its dividend for the benefit of the shareholders and the long term value of the company. At least that would be my advice if I was presenting to their CEO and CFO. 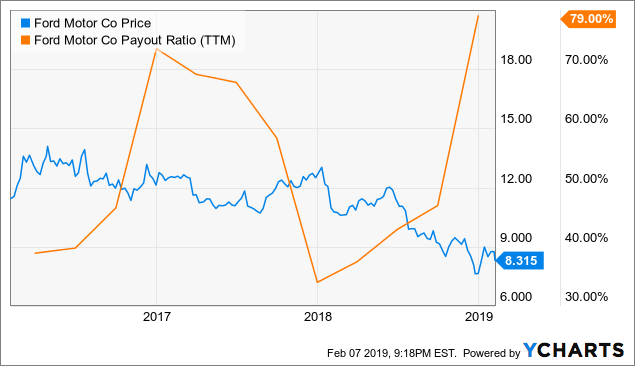 Even though Ford has not grown the dividend in recent years (they did have a special dividend a couple of years ago), its dividend yield has continued to increase due to the stock’s decline. Ford’s dividend payout ratio is just too rich and I believe is unsustainable. 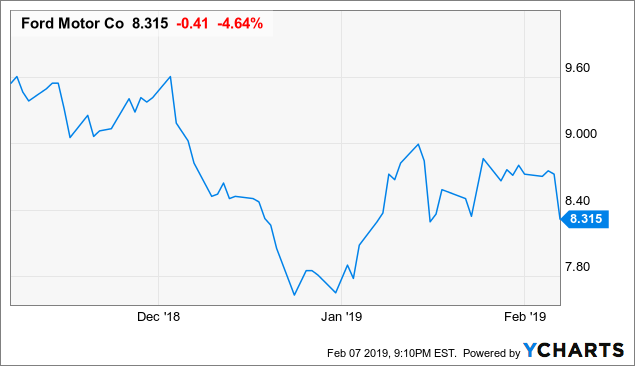 Can an argument be made that Ford’s dividend yield needs to be 327 basis points higher than GM’s? 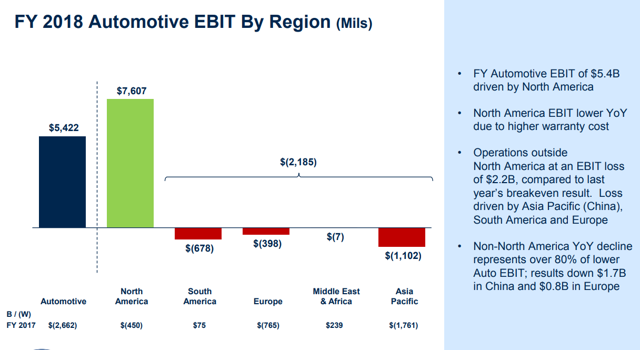 Equally, can Ford continue to have a payout ratio that is much higher than GM. If so, what would be the benefit of doing so? For many people, Ford is a sacred cow – the dividend is all that matters. However, one needs to be careful just to buy and/or hold a stock just for its dividend. For example, if you were a buy and hold Ford investor starting in 2002, you would have nothing but the dividend to show for the holding period. 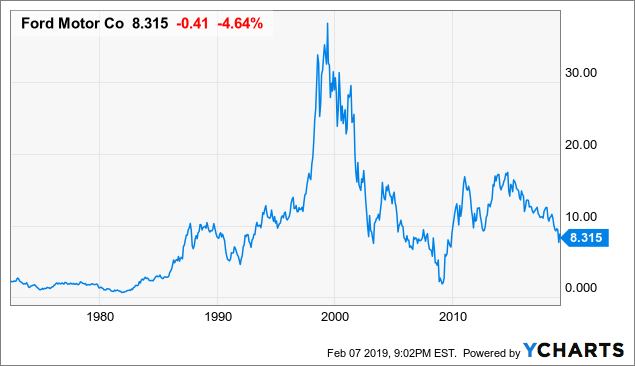 If, however, you bought in 1998, you would be approximately 50% underwater in the stock. Yes, one could reinvest dividends. Yes, it’s a good yield. However, I think there are better uses of your money for risk and return rather than Ford. Frankly, GM might be the better stock to own at this time if you feel like you want exposure to the automotive industry. While researching insider transactions showed very little relative information. I always like to look at publicly available ownership by key insiders. See below for a peak at the top few insider holders of Ford stock. Ford is investing more than $1 billion in its Chicago operations and adding 500 jobs as it launches three new SUVs this year. Enhancements include a new body and paint shop and major modifications to the final assembly area and adding stamping lines. Honestly, it’s good to see plants expanding and more jobs being created in the USA. While I’m bullish on the US economy, I’m aware that there are clouds forming where we could be getting set up for a 2008-like collapse in the stock market and equally, in US auto sales. Consumers have taken on too much debt – over-extended themselves – to buy the best and shiny now rather than waiting to purchase when they could afford something. 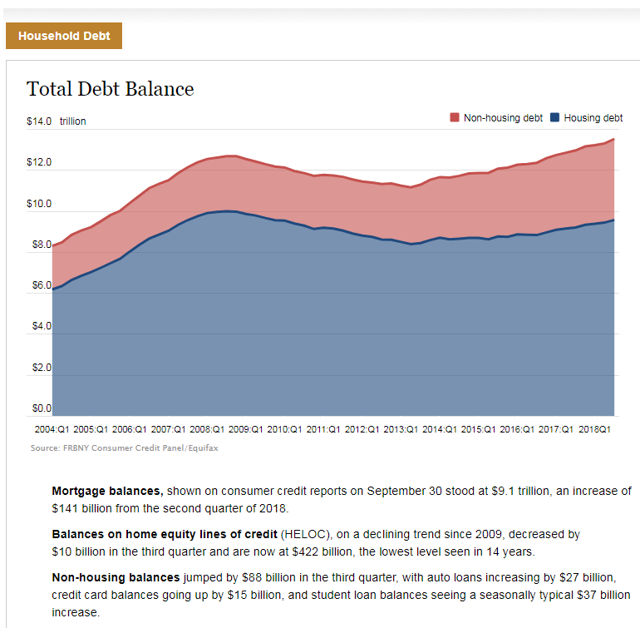 Simply put: Americans have too much debt. As regular readers of my work will see again and again, freedom – true financial freedom – does not come from having debt. The message is and always will be: pay cash for depreciating assets. Simply put, we, collectively, continue to live beyond our means. This very well could mean that our debt levels will crush and will force us to delay buying new cars. A very long term view: If one takes out the 1999-2001 period, it’s been rather stagnant. As noted above, what if there is another 2008-like recession? Will the current or future dividend be enough to keep you in the stock? We have not seen Ford closing prices this low since 2007-8. Technically, Ford is in a longer-term downward trend where we see lower highs and lower lows. A “Symmetrical Continuation Triangle (Bearish)” chart pattern formed recently on Ford. This is a bearish signal and hints that the stock price might fall to the range of 6.90 – 7.30 over the next 3-4 weeks. Ford has a current support price of 7.85 and a resistance level of 8.72. As we look at just a few key metrics, where do the metrics say the stock might be headed? The P/E is frightening. 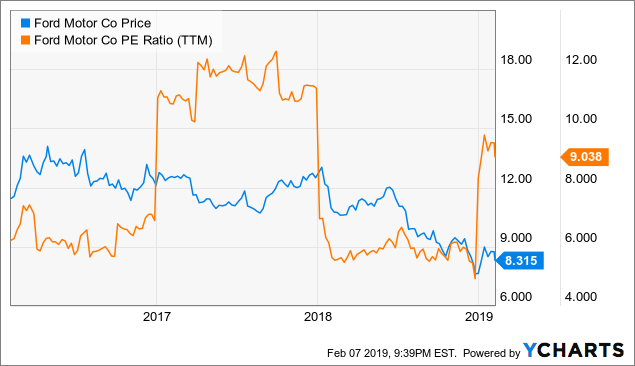 However, the enterprise value (EV) appears to be soaring relative to the stock price which could point that the stock is undervalued. 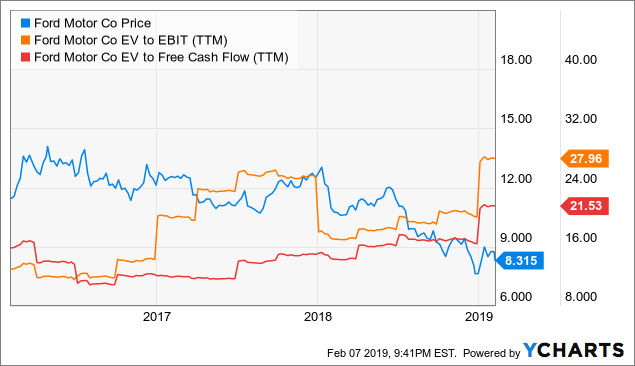 As EV alone is not that meaningful, digging into EV compared to earnings before interest and taxes (EBIT) provides a hint at possible strength in the stock. Overall, a mixed bag of results. Ford’s dividend yield is tempting for some. As other large companies with poor stock performance have done (e.g. 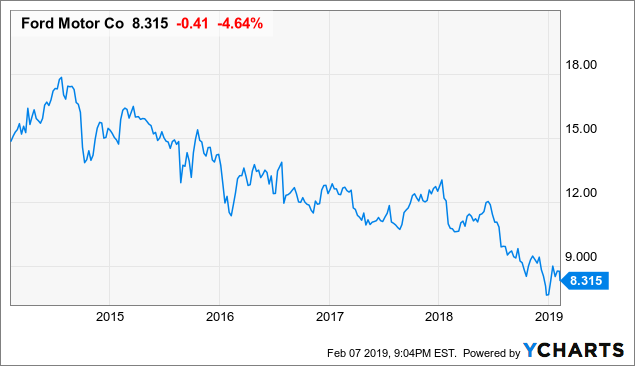 General Electric I would go ahead and cut the dividend to help mitigate a junk bond rating (which would be disastrous). If earnings continue to come under pressure, the dividend will eventually be cut. Given the overall industry weakness and the uncertainty of the tariffs and trade war, I will continue to pass on Ford. There are other places for dividends without the poor stock performance.